I was asked to write a piece on Buddy Guy’s album Skin Deep, which at the time was close to being released. In the article I mentioned how I wholeheartedly remembered the music legend’s work from the sixties… I listened to Skin Deep, and immediately loved what I heard, but for some reason it made me drift back to an album Guy came out with forty years earlier. A Man & the Blues was released in 1968, and today I can still visualize the album cover in my mind… I associate that particular LP to the upbeat atmosphere I was surrounded by at the time. In last year’s article I had to restrain from drifting too much. So I thought it might be cool to take the reflective trip I wasn’t able to make last year. Now I never normally go to church. That’s because I was more familiar with the synagogue further down the road. I remember thinking even at eight years old, how the Cantor when he sang sounded like Jack Bruce from the band Cream. That’s where my imagination led me even at that young age. A wild association I still get a kick out of telling today… Yes, I fondly recall those times being very buoyant indeed. So you could imagine how anxious I was going to church for the first time. I helped my brother’s friend and roadie The Big F load the gear out of the basement of our house (where they usually rehearsed) to the church hall. The guys were playing one their first live gigs that night and I was helping them set up. I remember it was the first time they got a horn section to back them up. The gig was going to be more of a family evening of entertainment; a moment in time where friends, music lovers and neighbors would get together and just have a blast. My brother’s band eventually got a reputation as a great local blues party band. In 1968 my brother and his friends were all teenagers looking for an outlet to express themselves through the love of the music that inspired them. Their enthusiasm and musicianship was well received. The guys loved what they did and it showed. Back then I was too young to express how the music I heard made me feel. All I knew was how important it felt to be around for some reason. And even though I knew deep down I wasn’t going to be a musician, I did know one thing- I needed to experience more of what was going on. I knew right then that music was going to play a big part in my life. It was just a matter of when. was born in July 30th,1936 to a sharecropper’s family, and was one of five children raised on a plantation near the small town of Lettsworth, Louisiana. He learned to play guitar on a self made diddley bow and eventually began performing in the fifties with local acts in Baton Rouge. In 1960 Guy worked at Chess Records and recorded “First Time I Met The Blues.” Later that same year he started working the first of what would be many projects with Junior Wells. As the sixties progressed, Buddy left Chess and soon got on a serious roll. He entered Billboard’s R&B charts, toured all over the world and shared the stage with many of the best musicians around at the time. A Man and & The Blues is Buddy Guy’s first full length solo LP. It featured Otis Spann on piano, bassist Jack Myers and drummer Fred Below. This recording is essential listening for any fan of the blues old or new. Hearing the music once again certainly reminded me of the impact it played in my life. As the sixties closed, so did a chapter in many of our lives. My brother and several of his friend’s would leave home and head out to the bigger cities in hopes of that one gig which would get them the attention they deserved. 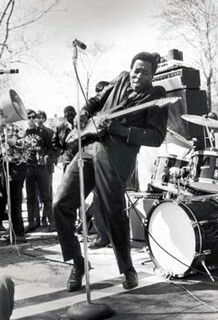 Buddy Guy continued to record throughout the seventies and eighties, but as the blues scene softened, so did the high profile gigs. It would take close to 20 years of perseverance, until new opportunities would flourish for Guy. And when it did, they would be huge! But that’s a story for another post. You definitely don’t want to miss the opportunity to see a true blues music legend as he continues his tour throughout this summer and into the fall… Dates and show times are subject to change, so make sure you double check. If you want more information on Buddy Guy’s Tour click on the link, or you can go to his web site by clicking here…. Have you seen Buddy Guy in concert before? Anyone checking out some of the shows listed below? Where were you when Buddy Guy’s 1968 release A Man & The Blues came out? Your comments are always welcome. I’ve seen Buddy 3 times. The most recent in Feb.09 with BB king. Buddy has influenced every blues guitar player for the last 50 years. Including me. Mary had a little Lamb is one i play..
Great repost! Anyone visiting Chicago can make it a Blues-day by calling Willy Dixon’s Blues Heaven at the Chess Studios at 2120 S Michigan. Or go to http://bluesheaven.com/tours/, make an appointment and see where, many say, the Blues began. What’s this to do with Buddy Guy? At the end of the tour you’ll be given a discount pass to Buddy Guy’s Legends. As a disclaimer, I did the tour and club about five years ago and am not sure if the passes were limited or even if the offer is valid anymore. So call first. I love the blues and being reminded of people and bands I have forgotten. This is a great article with great music thanks!!! Seeing Buddy perform at Legends later this month for the first time — I’m very excited. Buddy Guy is great. I am embarrassed to say that I grew up in the 60s and 70s but didn’t know about him even though he plays the kind of guitar I loved. Was he pigeon holed as a Blues-only guy and therefore wasn’t as mainstream as Hendrix and Clapton? I don’t get it? Fun stuff! I got Buddy Guy’s “A Man and The Blues” when it first came out. In Ann Arbor we all saw Buddy’s first road trip with his own band when he played at the “folk club” “Canterbury House”. I have photos from that night. (Albert King and Doc Watson and many others played there also). I love all Buddy’s stuff and I remember “Just Want To Play My Axe” so well. A few of us from our band in ’65 or ’66 saw Buddy play with Junior Wells at “Theresa’s“ (sp?) in Chicago. Bob Koester took us there. I wonder if, perhaps, a lot of Buddy Guy fans don’t realize how great he was before he was “discovered” — any purists or older people that followed Buddy know what I mean. He was never a “loud” player and didn’t adopt the “thicker”, “fatter”, “heavier”, (and louder) sound until later. A Man And The Blues demonstrates the sound that I heard from Buddy Back in the old days (including the Ann Arbor Blues Festivals). Thanks! I just stumbled onto this website — for all I know it’s no longer active?